St. Vincent took part in Sydney Festival's "Play Me, I'm Yours" public piano project in addition to playing three sold-out performances at The Famous Spiegeltent. For more info on the project, click here. For three weeks each January the Festival offers a rich program of around 80 events involving upwards of 500 artists from Australia and abroad covering dance, theatre, music, visual arts, cross media and forums. In any given year, it makes use of most of the main theatres across the city including Sydney Theatre, CarriageWorks, City Recital Hall and venues at the Sydney Opera House. 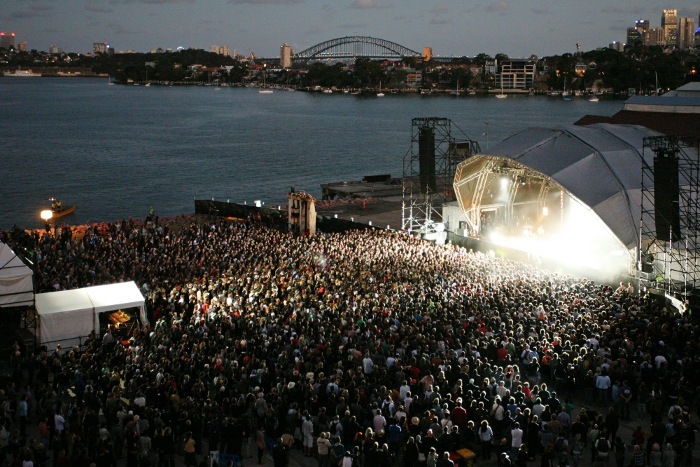 Sydney Festival also presents a number of quality, free outdoor events such as the long-running Festival in the Domain with Jazz and Symphony concerts, each attracting up to 100,000 people. In 2008 the Festival introduced a new opening event, Festival First Night, for which people are invited to take to the streets to enjoy a large-scale celebration of music and performance. In its inaugural year, Festival First Night attracted 200,000 people into the heart of the city. In addition to St. Vincent, other artists who played this year's Sydney Festival include Sharon Jones & The Dap-Kings, Nick Cave and the Bad Seeds, Z-Trip, Bill Callahan., and even A-Trak and Santogold. Today and tomorrow, Bon Iver is playing a couple of shows (here and here). Juana Molina also has scheduled sets on January 30, 31 and February 1. Sydney Festival also has a flickr account to check out all the pictures and even a blog, which you can check out here.